Sen. Mark Udall, left, and Rep. Cory Gardner shake hands backstage before a debate on Oct. 7 in the auditorium of The Denver Post in Denver. Colorado is a tipping point state in presidential elections — lately, it’s been the tipping point state. Arrange all the states by President Obama’s margin of victory in 2012, starting with his biggest wins, and add up each state’s electoral votes. The state that gets you to 270 is the tipping point state. In 2012 and 2008, that was Colorado. Colorado’s place at the center of the political universe seems to be secure this year. The Senate race between Democratic Sen. Mark Udall and Republican Cory Gardner has been one of the most competitive for most of campaign season. That’s why the strength of Gardner in recent polls has been so important in our Senate forecast, which currently gives Republicans a 66 percent of securing a majority. Gardner’s chance of winning has risen to 80 percent. He has led in all but one of 15 nonpartisan sponsored surveys released since mid-September, and by an average of 3.4 percentage points. That includes a newly released Ipsos poll that has Gardner ahead 47 percent to 45 percent, and a new Suffolk University poll that found Gardner up 46 percent to 39 percent. Gardner was only ahead by 1 percentage point in the previous Suffolk survey. Yet we’re beginning to hear arguments not to trust the polls in Colorado. Skeptics point to polls there in 2010 and 2012 that underestimated Democratic strength. Others argue that the polls aren’t including enough Latinos, and that there’s too many white respondents. Or that the Latino vote is too Republican-leaning. Or that maybe Colorado’s vote-by-mail system will complicate things, making it harder to know who will vote this year. Pay no attention to those public polls. Instead, Democrats are pushing two recent surveys by the well-respected Democratic pollsters Joel Benenson and Mark Mellman, both showing Udall leading by 3 percentage points. It’s true that polling in Colorado has overestimated GOP support. The FiveThirtyEight projections in the 2010 Senate race and 2012 presidential race, mostly based on the polls, were off toward the Democrat by 2.7 and 2.9 percentage points, respectively. But Gardner’s lead is nearing a point at which he could afford a polling error of that magnitude. He’s up by 2.4 percentage points in our latest projection. Udall would need every bit of those past errors to pull out the victory. You’d also have to think the mistakes pollsters made in the past will happen again this year. But pollsters adjust their methodologies. Furthermore, two elections in a row doesn’t mean the polls “always” underestimate the Democratic candidate in Colorado. In Udall’s last campaign, in 2008, he was projected to win by 11.1 percentage points by FiveThirtyEight. He won by 10.3 points. In other words, the FiveThirtyEight estimate — again, based mostly on the polls — slightly overestimated Democratic strength. Second, there’s isn’t much evidence public pollsters are overestimating the share of Latinos will make up of voters. The recent Benenson and Mellman surveys projected the electorate to be 84 percent white and 9 percent Latino, and 79 percent white and 9 percent Latino, respectively. What have public pollsters found? The past five polls released in Colorado to list demographic breakdowns have used samples, on average, 79.7 percent white and 11.3 percent Latino. In other words, the public polls are less white and more Latino than the two recent Democratic-leaning surveys. These five public polls found Gardner ahead by an average of 4.4 percentage points. So, we don’t have any compelling reason to think the public polls are underestimating Latino turnout, but maybe they’re reaching disproportionately Republican-leaning Latinos? Not really. The Benenson poll, which showed Udall up 3 percentage points overall and released a breakdown of the vote by race, had Udall winning by 22 percentage points among Latinos. The past five public polls with a Latino crosstab found Udall leading by 28 percentage points among Latinos, on average. The Suffolk poll released Wednesday had Udall winning Latinos by 73 percentage points. Picking apart a poll’s subsamples, which have big margins of sampling error, is usually a waste of time. But for what it’s worth, these public polls have had Latino subsamples more Democratic-leaning than the left-leaning polls. The real reason the public polls differ from the Benenson and Mellman surveys is because the public polls have Gardner doing better among white voters. Gardner leads among whites in those five public polls by 10.6 percentage points, on average. In the Benenson survey, Gardner and Udall were tied among white voters. Whites make up most of the electorate, and so that lead is worth 8.4 percentage points in the overall sample — pretty much the entire difference between the public polls and the Benenson survey. Finally, it’s possible that all-mail voting will throw off the pollsters, but there isn’t any evidence it will. Oregon has had all-mail voting since 2000, and Josh Katz of The New York Times has found it had the seventh-lowest error rate in Senate polling out of the 36 states he studied. 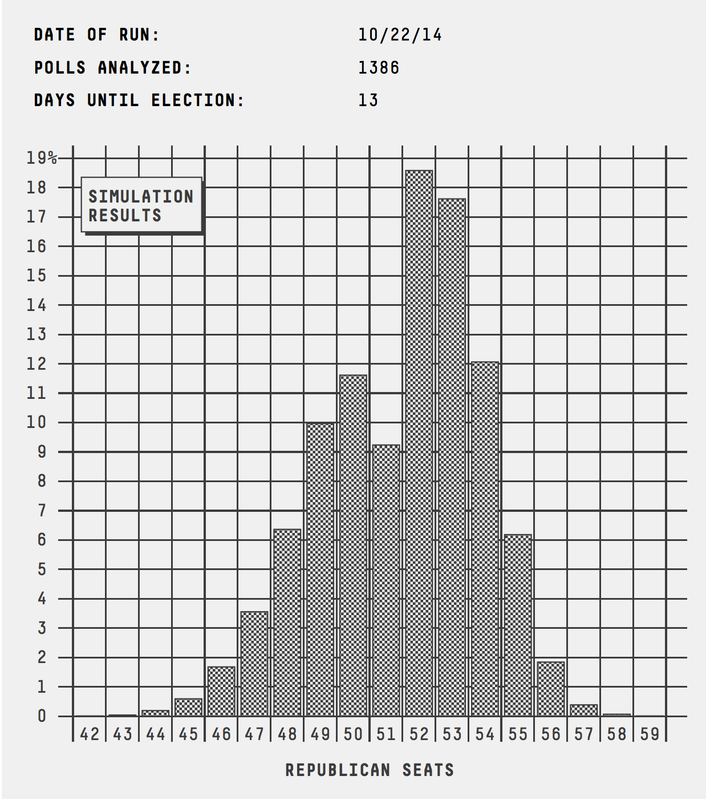 Washington switched to all-mail voting for the 2012 election, and the polling average in the 2012 Senate race was off by 0.5 percentage points. Pollsters haven’t had problems with vote-by-mail states. The FiveThirtyEight forecast projects Gardner as an 80 percent favorite. The polls aren’t too far off from our model’s “fundamentals” projection, which accounts for the state’s partisan history, the national political environment, candidate quality and candidate fundraising. Gardner leads in our fundamentals projection by 0.5 percentage points. The polls and the fundamentals tell the same basic story: An unpopular incumbent is losing in a purple state against a decent candidate in a slightly Republican-leaning year. That’s a pretty believable story.